Installing our GDPR tools into your HTML files is extremely easy - there's essentially just two steps. There are a few places you might find this, so we'll cover each scenario. This is common for small websites with no Content Management System (CMS). 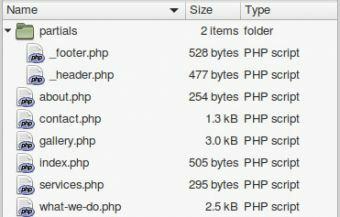 Note that files may have other extensions, such as .htm - if you're files aren't a .htm* type (for instance they are .php), you may need the next step. Open one of these files, e.g. index. If you see your <head> tag at the top of the file, you're in the right place and can proceed to step 2. Note that in this instance, you'll need to complete step 2 for every file in your website. If you haven't found a <head> tag here, the continue to option b. For modern and/or larger websites, it's common practice to break page code down into re-usable pieces. This allows websites to be edited much more easily, as header and footer content (and perhaps other elements) can be edited once, and the change will be shown on all pages - which is a big benefit as your site grows. Look for files with names like header or top or template - or anything else that might fit the bill. They might be in one directory, or you might have to go hunting for them. Try folders with names like partials, components, skin, theme or template. Make a list of all the files that you find containing a <head> tag, then proceed to step 2. If you've still not found your <head> tags, or think you may have missed some, you can try performing a code search. Adding our code is super simple! Make sure to add the line everywhere you have an opening <head> tag, as the code needs to load on every page. It's as easy as that - one line of code.